HashLink is a virtual machine for Haxe. It can be used to build native desktop applications as well mobile platforms (Android / iOS) and consoles. This tutorial requires you to have completed already the Installation, including the HashLink specific parts. 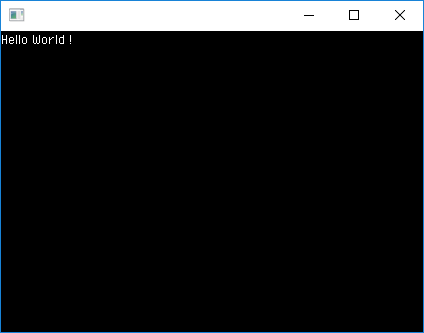 Please also read Hello World as we follow the same steps but with some changes. 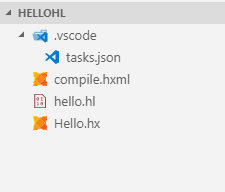 Create a new folder helloHL and a compile.hxml file similar to what is done in Hello World example. The -lib hlsdl tells Heaps to compile with SDL/OpenGL support. If you are on Windows you can use -lib hldx instead. Follow instructions on Hello World regarding compilation, and use the same Main.hx source file. 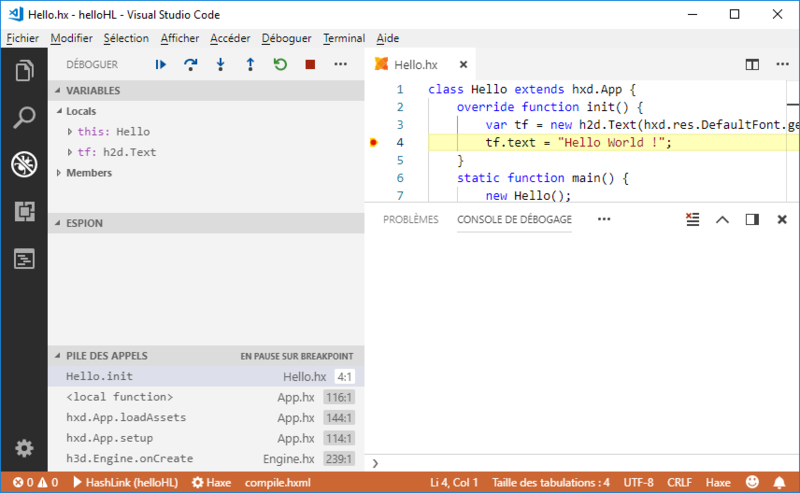 If everything works fine you should get a hello.hl file compiled and ready to run. Select in menu Debug > Add Configuration. This should give you the choice to Debug with HashLink. If not, make sure to install HashLink Debugger extension. Note in particular that you need to set the correct hxml file that contains your compilation parameters. The hello.hl file contains bytecode that can be run with the HashLink virtual machine using hl hello.hl. It does give quite good performances and have been proven by successful commercial games such as Northgard or Dead Cells. However, it is also possible to compile the HashLink code using a native compiler. This allows to compile for consoles and mobile. This is done by changing compile.hxml to use -hl out/main.c instead of -hl hello.hl. This will create a directory out containing a lot of generated C code that needs to be built using a native compiler and linked to the same HashLink runtime that the HashLink virtual machine is using.